"MotionCounter" was developed with the goal of making a simple fitness app to be useful to all regardless of level of commitment to regular exercises. "MotionCounter" encourages you to set goals for your activities and watch how many of your goal(s) are being accomplished. Or you can setup notifications for your goals and forget about constantly checking your progress. "MotionCounter" displays your daily activities including total steps, walking, running, and even your commute. You can backtrack your daily activities up to 7 days. 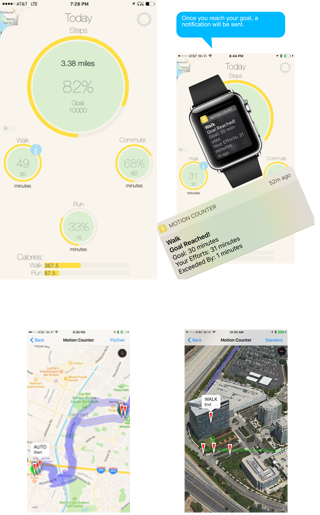 "MotionCounter" displays your daily activity routes on the map with different overlay colors. Green represents walking, red represent running and purple represents commuting. Special pins mark the start and end of an activity. "MotionCounter" utilizes “Location Manager” along with “Motion and Fitness” to make sense of your device’s sensor data and display your activities using an elegant and easy to read design. Check out collection of our applications for your iPhone and iPads. © 2015 - AGD Studio Inc.